The London 2012 Olympic Games velodrome will officially launch today – Tuesday, February 22 – with an opening ceremony featuring several of Britain’s track stars, fresh from appearing at the Track World Cup in Manchester at the weekend. The distinctive ‘Pringle’ velodrome in the Olympic velopark is the first venue for the Games to be completed, and the structure has been widely applauded for its architecture and for the fact that – rarely for a national sporting venue – it has been completed on time and without construction problems. British track stars Sir Chris Hoy, Victoria Pendleton and Becky James will all be there, alongside chair of the London 2012 Organising Committee Seb Coe, UCI preisdent Pat McQuaid, British Cycling president Brian Cookson and a mass of press eager to start the 2012 build-up in earnest. 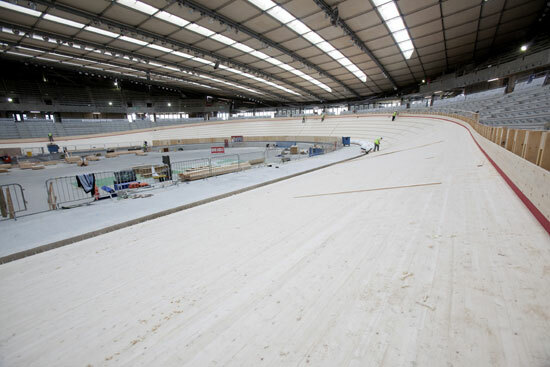 The velodrome’s shape looks like a giant Pringle crisp, and mimics the lines of the cycling track contained within it. 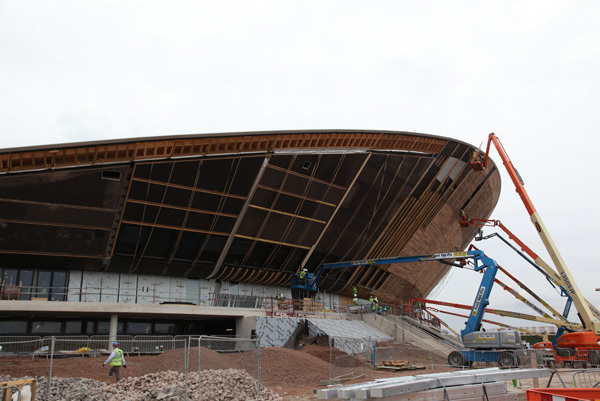 Architect for the project was Mike Taylor of Hopkins Architects, and the Siberian pine track was designed by Ron Webb, also responsible for the Manchester and Newport velodromes. Inside, the velodrome is naturally lit with a roof free from girders and supports providing a wide, uncluttered arena. A total of 16 kilometres of steel cable keep the roof securely in place. Triple 2008 Olympic champion Sir Chris Hoy had a say in its design, and there are numerous touches that only someone who truly understands track racing will have incorporated. For instance, there’s a dual heating system so that the track area is warmer than the ventilated 6,000 seat spectator area. Perfect for setting world-record-setting times whilst keeping the fans cool. 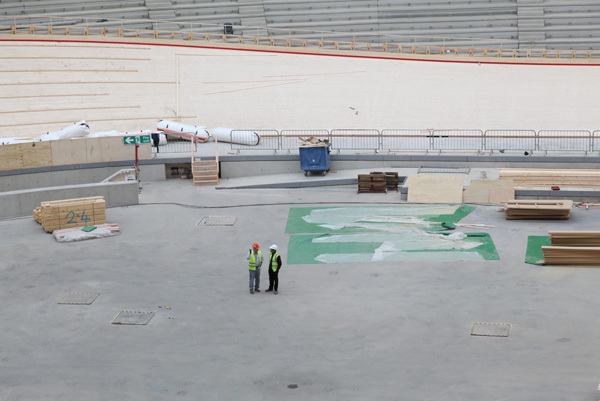 Cycling Weekly will be at the London 2012 velodrome opening and will be bringing you photos and a report from the venue.